Who decides if a person is fashionable or not? Is fashion only for beautiful people? Is there an ideal body type? Is there an “ugly person” concept in fashion? Why do fashion magazines put skinny models on the cover? Is there an ideal body shape in fashion? What are the beauty standards in fashion? Does the fashion industry have a negative impact on society? For Bridge 1 project, we were assigned to write 100 questions about fashion. I found myself asking questions about how the fashion industry use body image. From the questions I wrote, I highlighted 10 questions I was drawn into and inspired. 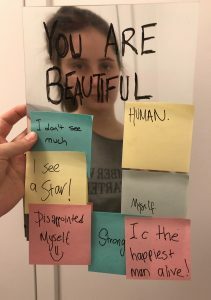 With those 10 questions about body image and beauty standards, I came up with an idea where I can make social experiment about beauty. For my 3D project, I bought a mirror and wrote “you are beautiful” on it and started walking around Washington Square Park asking strangers how they felt when they look at the mirror. I asked them to write down their feelings on a post-it. Most of the answers were optimistic which was a success for me because I wanted see if people look at theirselves in the mirror and compared theirselves with some model on a fashion magazine cover and wrote an answer according to it, which didn’t happen most of the time. At the end of my project/experiment, I saw a relationship with the 4 pieces I made in studio with my seminar project. In both of my works I criticized the standardized part of fashion.